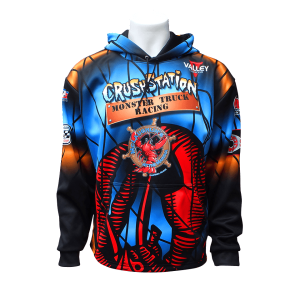 Our fans have asked and now they shall receive, as our all new Crushstation Monster Truck Crew Shirts and Hoodies are now available for purchase through our awesome sponsors at Valley Fashions! 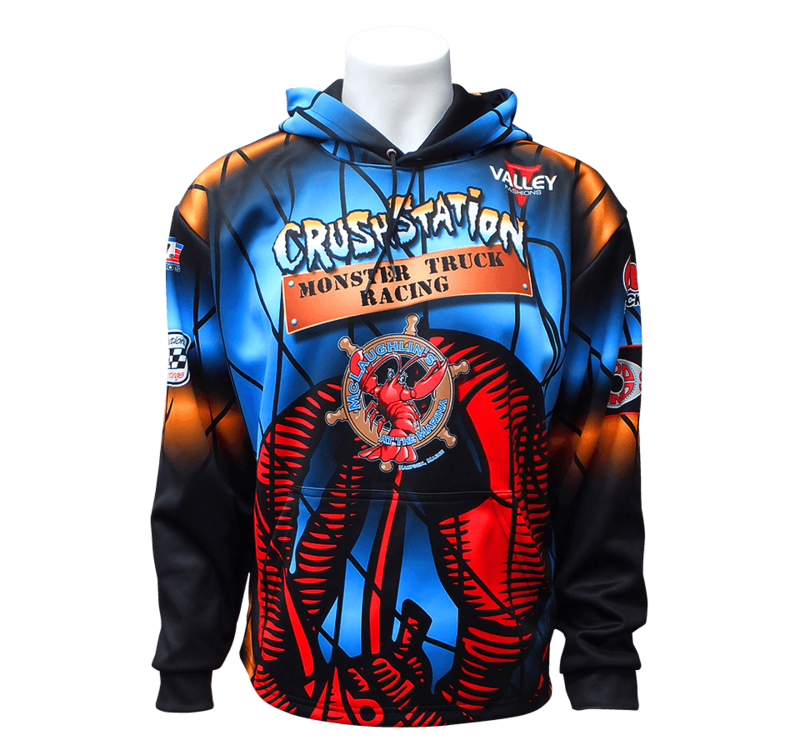 These dye sublimated crew shirts and pullover hoodies are just like the ones Greg Winchenbach and the Crushstation crew wear every weekend. Be sure to check them out at the Valley Fashions Fan Fare Page to pick up yours. Also don’t forget to check out our Merchandise store for other t-shirts, hats, toys and more! 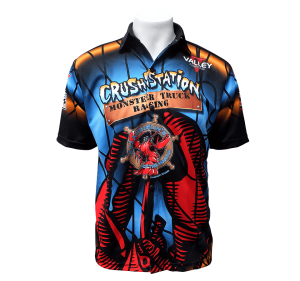 Be on the lookout for more new merchandise on our store as we’ll be adding new Crushstation T-Shirts soon. 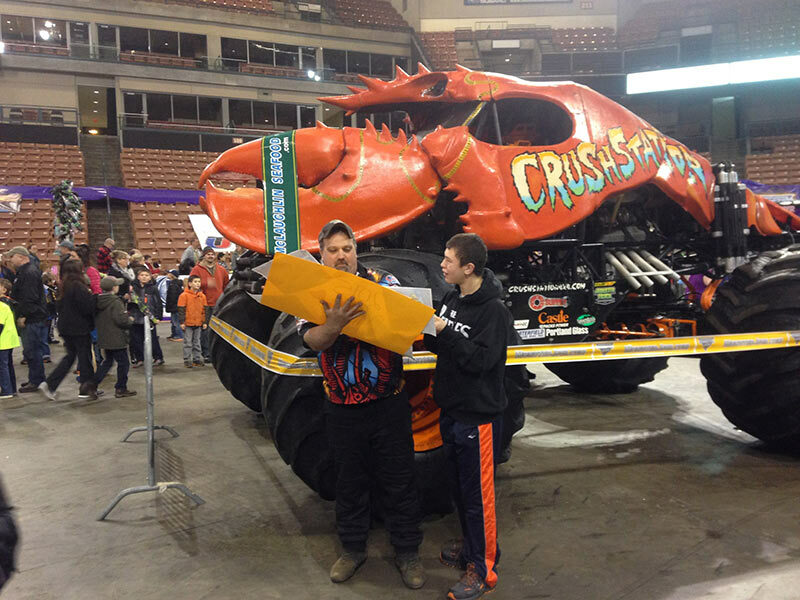 For now keep up with The Monstah Lobstah on our Facebook page for the latest updates as we’re currently rocking the Monster Truck Throwdown tour. 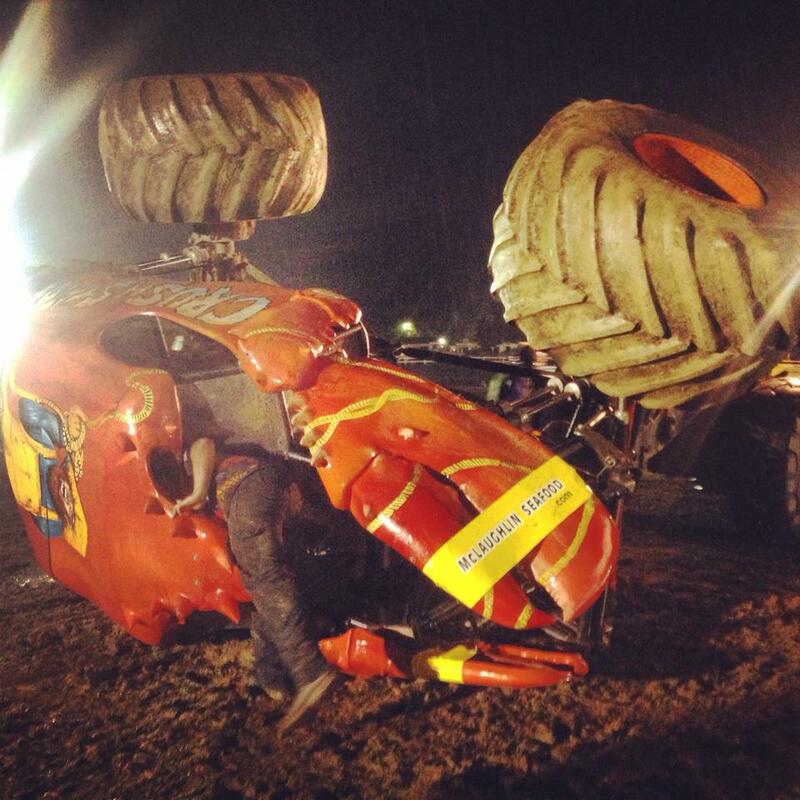 It’s been a super busy start to 2015 with plenty of shows and action for the Crushstation crew. Since our last update the team has been to Detroit, Albany, and Washington D.C. thrilling fans with the Monstah Lobstah along the way. The second stop of the season brought the Crushstation to familiar territory as they visited Detroit, Michigan’s Ford Field. 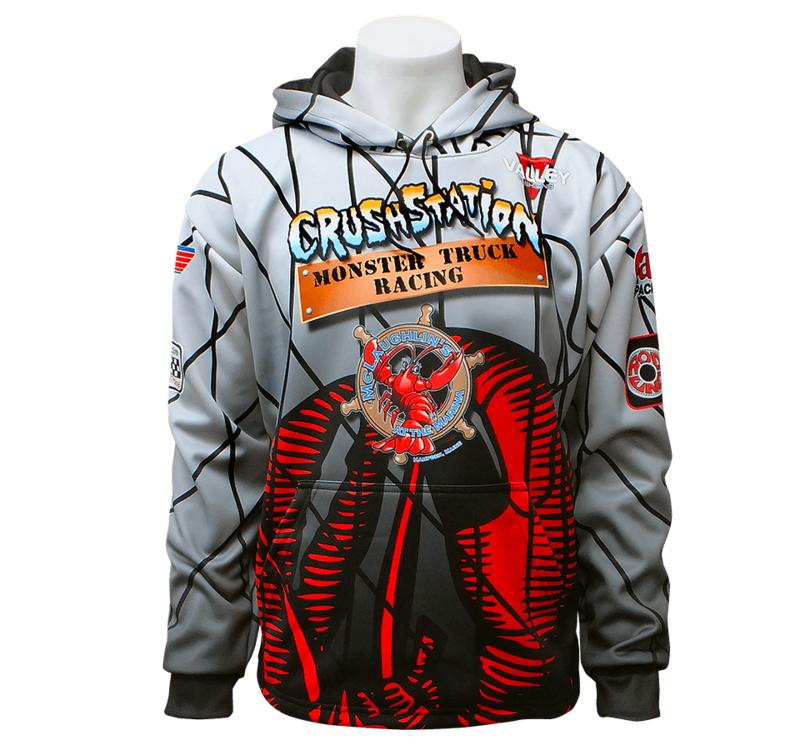 Driver Greg Winchenbach and crew chief Mike Thompson worked hard on the Crushstation during the week and were amped up for their only stadium event of 2015 and ready to rock the house. The night started off well as Greg qualified 8th and made the cut for the racing field. 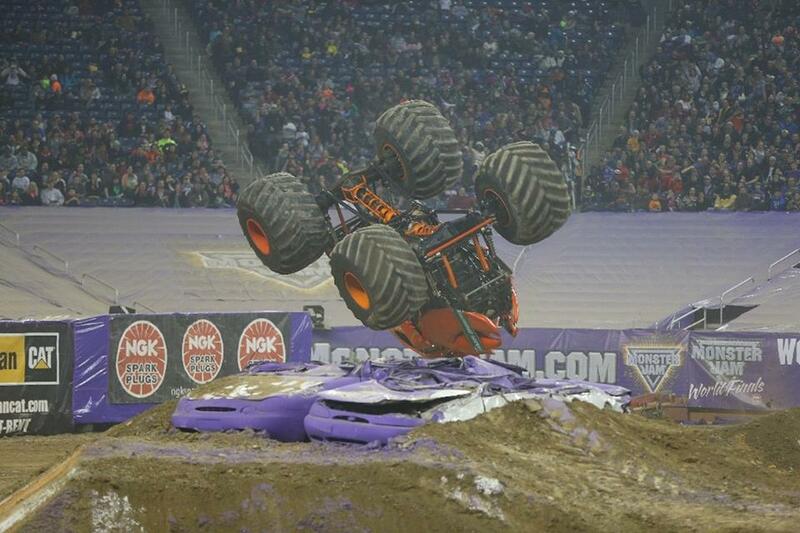 Unfortunately Greg wasn’t able to take out fastest qualifier El Toro Loco in round one to advance. In freestyle, they delivered the Wow Moment of the night, but it wasn’t they way they wanted to. Greg opened up his run with a great sky wheelie, which he combo’d into an awesome slap wheelie. 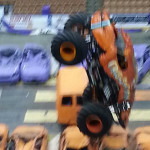 Greg walked the Crushstation the length of the floor, but a rear wheel clipped an obstacle which sent the truck cartwheeling end-over-end and eventually on top of fellow competitor Storm Damage. Luckily Greg as well as the Crushstation and Storm Damage were unharmed with mostly cosmetic damage to both trucks. After some repairs at Mad Man Motorsports in Michigan the Crushstation team loaded up and headed east to Albany, New York’s Times Union Center for a two show weekend. They got off to a great start Friday with a second place finish in the wheelie contest to our buddy Steve Thompson and Hurricane Force. Then it was another second place in the obstacle course behind the Bounty Hunter. Round one of racing saw a win over Storm Damage, but a broken shock would keep them from finishing the racing bracket. Mike thrashed to get the truck back for the donut competition and freestyle where their efforts paid off with a third in donuts and a first place finish in freestyle! 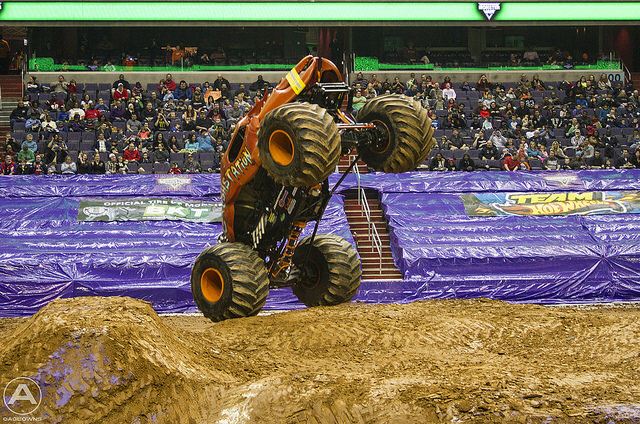 Saturday in Albany saw two more victories added to the season total as Greg tailplanted the Crushstation to a wheelie victory, and then scored the obstacle course win. They were on their way to another good freestyle run but a broken steering pump would take away their chances of a repeat. All in all it was a great weekend in Albany. 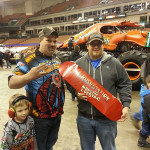 From Albany the team traveled south to the nation’s capital for a weekend at the Verizon Wireless Center in Washington D.C. Greg and the Crushstation found themselves going head to head with legendary Grave Digger driver Pablo Huffaker most of the weekend as they battled for the top spot in the competitions in all three shows. With some rocking wheelie contests and freestyles it was a great weekend with one Obstacle Course win, a wheelie contest win, a tie for first in one freestyle, and two second place freestyles. It’s been a long month but a good one overall for the Crushstation team as they continue into a busy 2015 season. 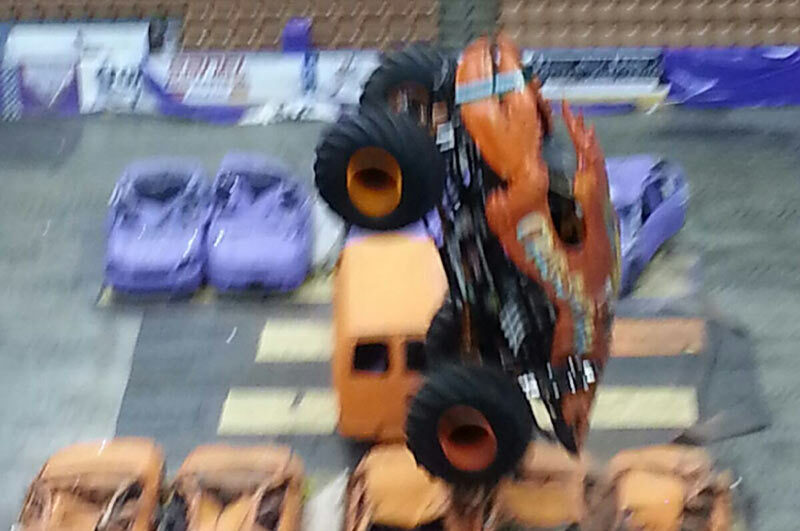 Next weekend the team heads to the IZOD Center in East Rutherford, New Jersey for another weekend with Monster Jam. Be sure to keep up with us on social media by liking our Facebook and following us on Instagram! 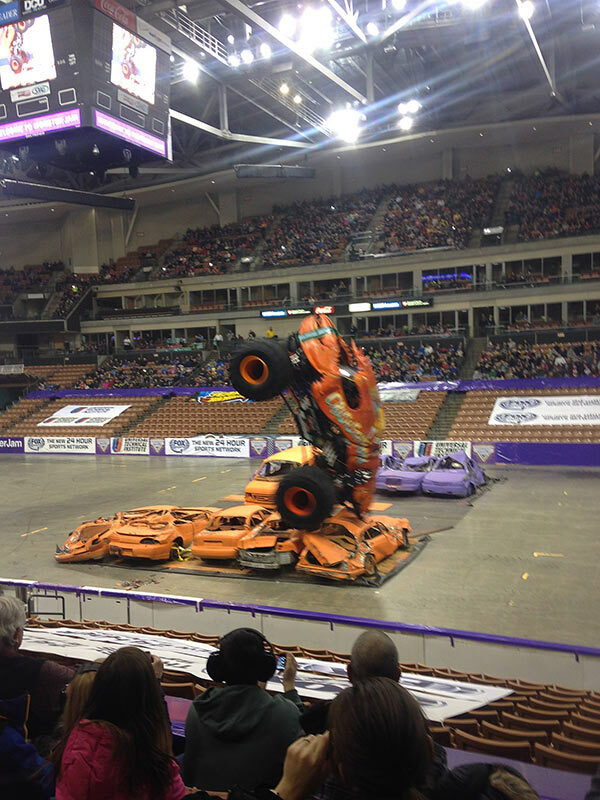 The new year is already upon us as Greg, Mike, and the Bottom Feeder Motorsports gang made the trip down to Manchester, New Hampshire’s Verizon Wireless Arena for their first Monster Jam of 2015. The refreshed Crushstation was ready to do what it does best and make some mayhem in Manchester. Before the events Greg got to meet many awesome fans at the Party in the Pits where some of the fans showed up with their own Monstah Lobstah signs and creations. Friday night would be the first event of the weekend and Greg got his first win out of the way early as he planted the Crushstation’s tail into the cars with a spectacular wheelie in the wheelie contest. Round 1 of racing saw Crushstation fall to Monster Mutt Dalmatian but they would return in the semi-finals as the fast loser. Greg took advantage of the reprieve and was able to defeat Storm Damage. Greg would meet the Northern Nightmare in the final round, but come up just short of taking the victory. On Saturday Afternoon the success in the wheelie contest continued as Greg put up another tail plant from Crushstation and stood the truck straight up and down on it’s way to victory. 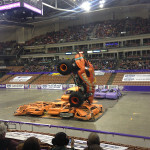 In racing Greg defeated Monster Mutt Dalmatian in round one before falling to Scooby Doo in the semi-finals. 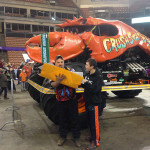 The donut contest saw a wicked set of cyclones laid down as the Crushstation smoked the floor with a ferocious donut. The judges would score the performance with a score of 23 which was good enough for third place. Freestyle saw some big moves with some good leaps over the cars and the van stack before Greg mixed things up with a jump in reverse over the vans! The run set the tone for the rest of the field and only Grave Digger and Northern Nightmare able to top the Crushstations score of 21 for a third place. Electrical issues Saturday night started early during the event when crew chief Mike Thompson discovered the culprit, the magneto. Unfortunately there wasn’t enough time for repairs and the Crushstation would be sidelined for the rest of the night. The team has headed back to Maine to prep the truck and get ready for a trip west to Michigan as the Crushstation returns to Ford Field! Be sure to follow us online by liking us on Facebook and following us on our new Instagram account @crushstation. In front of record breaking attendance for the first ever Monster Truck Throwdown at the Windsor Fair, the hometown hero Greg Winchenbach and Crushstation dominated the competition all weekend. To kick off the weekend, Maine fans witnessed one of the most incredible wheelies of the year. Greg sent Crushstation into a wild, past-vertical wheelie earning him top-honors in Saturday’s wheelie contest. Due to the incredible force of the wheelie, the skills of crew chief Michael Thompson were put on display. Mike diagnosed the ailing Monstah Lobstah and had the truck back on track, ultimately sending them to the Racing Final Round against tough competitor (and Mike’s brother) Steve Thompson in Hurricane Force. Crushstation crossed the line first in the final round, but was penalized for not hitting the final jump properly giving Hurricane Force the win. For the final competition of Saturday night, mechanical gremlins would strike as the rear steering system would fail. This wouldn’t stop Winchenbach as he maneuvered Crushstation to a freestyle win with a vertical slap wheelie and incredible save in front of the hometown fans. Sunday’s weather forecast played havoc on all of the monster truck competitors as heavy rain fell throughout most of the show. Despite the conditions, Greg managed to slip his way to a final round appearance against Illuminator before the slick conditions and smooth driving by Illuminator bested the Monstah Lobstah. 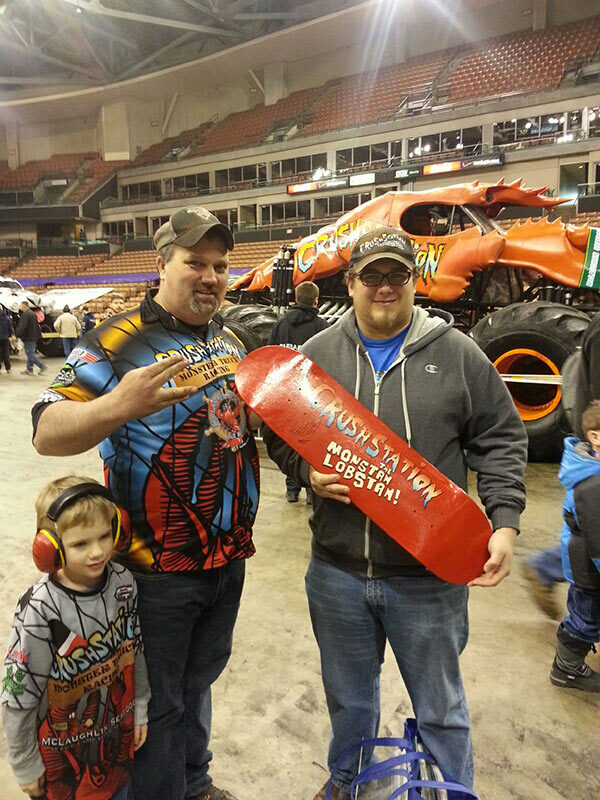 Greg would not be outdone in freestyle for the second night in a row as he drove Crushstation to a wild, freestyle championship winning run which ended in a wild rollover and a broken spindle. The team nears the ends of its impressive 2014 season with only a few shows to go. Check out the Upcoming Events schedule to see the Monstah Lobstah Team live! 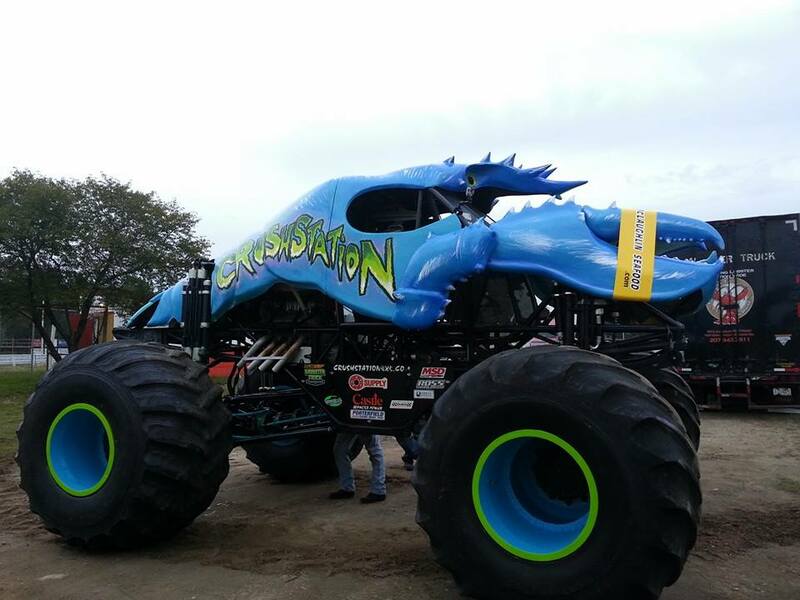 For many years, Bottom Feeder Motorsports team owner Greg Winchenbach has had the idea of doing a special paint scheme for the Crushstation “Monstah Lobstah” – the incredibly rare blue lobster, seldom caught by Maine fisherman. 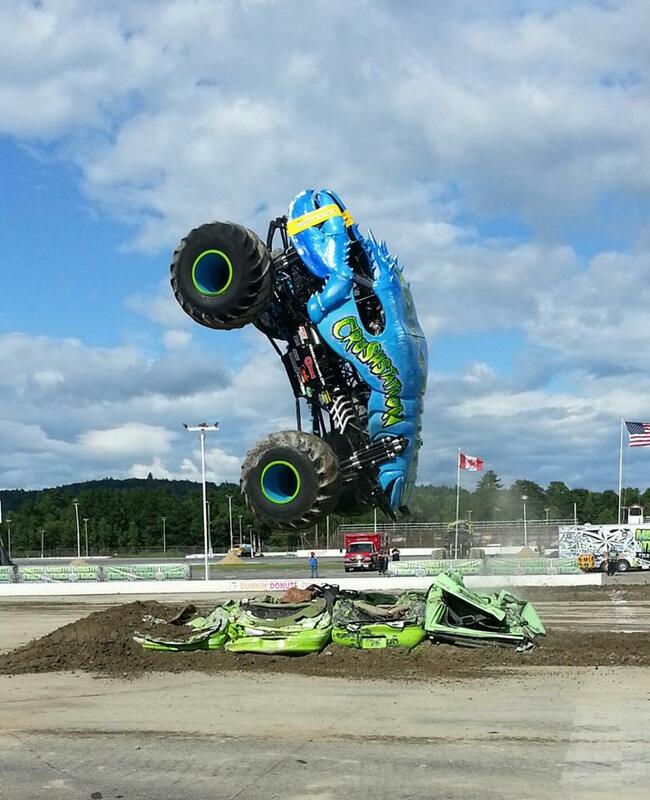 After the establishment of the wildly successful Oxford, Maine Monster Truck Throwdown event at Oxford Plains Speedway last year, Greg knew that there was finally an event to make it happen for. 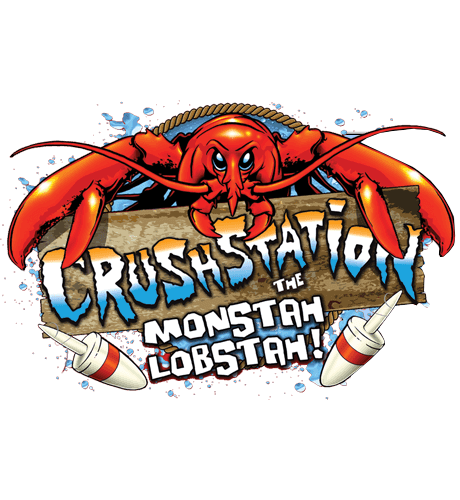 With the help once again of incredibly artist Glenn Chadbourne – known for his famous artwork for Stephen King novels, and the regular painter for Crushstation – the blue lobster came to life in spectacular fashion. Unfortunately, the debut of the truck in Oxford didn’t go quite as planned. Motor issues plagued the team throughout the Saturday night event, but hard work from crew chief Michael Thompson, and with the help of friends like Jim Koehler, Tim Mente, Brad Allen and Jeffrey Fielding, Crushstation was ready for action on Sunday. After the rough show Saturday, Greg was bound and determined to put on a great show for the Maine fans and laid down an incredible effort in the wheelie contest, nailing down the victory. After a solid effort in racing, Greg once again took to the track with full vengeance. In a freestyle performance that featured, wheelies, donuts and huge air, Crushstation would end the day victorious. Despite some trials, the Oxford weekend was once again a great one for Bottom Feeder Motorsports, and the debut of the special blue lobster paint scheme was a huge success. 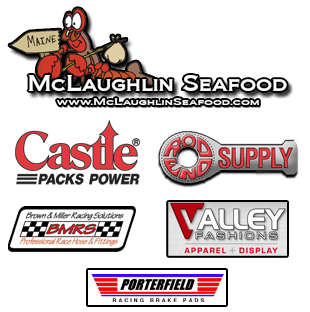 A huge thanks to all of our incredible sponsors who help make it all possible – McLaughlin Seafood, BMRS, Rod End Supply, Castle, Viper Venom Race Fuels, Porterfield and Valley Fashions. One more event in Maine to finish the month as the Monster Truck Throwdown returns for an event, literally just up the road – the Windsor Fair in Windsor, Maine August 30th-31st. We hope to see you fans there, it’s going to be a great show!